Welcome back to another school year! The Essential Educator will keep you up to date each month on upcoming events, workshops and materials in K-12 and non-formal education. Our goal is to keep you informed about professional development opportunities and give you the resources you need to become a “natural resources” educator. Michigan is fortunate to have some of the most magnificent resources on the planet. These resources belong to you! It is our privilege to protect and manage them for all of us! The Michigan Alliance for Environmental and Outdoor Education (MAEOE) will celebrate 30 years of quality professional development and the advancement of natural resources education at its fall conference October 5-8 on the campus of Central Michigan University. If you have driven through mid-Michigan and wondered about the efficiency of the wind mills along Hwy 127 near Ithaca, here is your chance to find out. The Energy Field Trip on Friday morning, October 5, includes stops at a wind farm as well as other experiences involving solar energy and a co-generation plant in Midland. This Energy Tour is only one of many field trips, breakout sessions and workshops that are all part of the conference program. Details and registration are available at www.maeoe.com. Whether you teach first grade or high school, the Michigan DNR has a program for you. 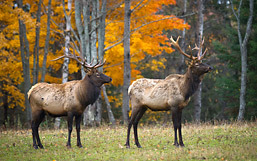 Go Wild for Michigan Wildlife, A Year in the Life of a Black Bear and Elk University are all back by popular demand. Learn about Michigan wildlife and meet standards by enrolling in each of these programs. For more information go to the DNR's Teachers' Resources Wildlife Education Outreach page (or you can go to www.michigan.gov/dnrteachers and click on Wildlife Education and Outreach). Spawning salmon, massive gatherings of sandhill cranes and thawing ice jams are just a few of Michigan’s natural wonders. 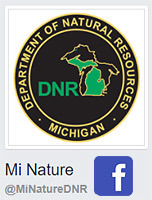 These types of events, along with education facts and more, are the heart of DNR’s new Facebook page, Mi Nature. Contributors are DNR field staff, professional interpreters at locations statewide, who monitor the pulse of nature for a living and, in turn, explain its relevance through face-to-face programming to thousands each year. Mi Nature will also include upcoming nature programs and other DNR education opportunities. Visit Mi Nature on Facebook and follow, like and share our page to keep up with Michigan Nature facts, tips, and fun educational tips from the Great Lakes Region and beyond!